Sand Storm Clouds. © Copyright 2019 G Dan Mitchell - all rights reserved. 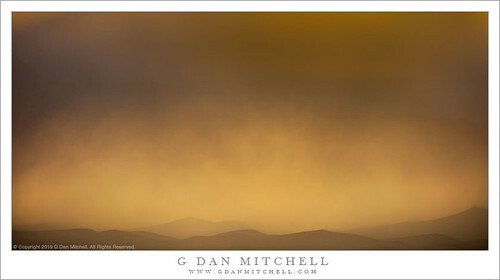 Sand storm clouds nearly obliterate the light above dunes and mountains. Desert sand (or dust) storms are complicated things, bringing extraordinarily difficult conditions but also sometimes amazing visual opportunities. Operating within the worst of them is almost impossible, especially for a photographer trying to manage sensitive equipment and lenses... and manage to see and breathe. It can be done, but most people should not try. (I once read a semi-official description of Death Valley sand storm conditions on the dunes, in which the writer basically said, in no uncertain terms, "Don't even try." And then followed up with a description of the steps necessary to function in the storm... which would likely dissuade any sane person.) I've been caught in these storms more than once, even camping in a couple of them. I can assure you that it was not at all pleasant. Yet these storms are also powerful and awe-inspiring events. ("Awesome" in the original sense of provoking awe.) I recall once a couple of years ago driving down into another such storm — much worse than this one — and listening to the sound of sand hitting the vehicle... and then the sound of small pebbles falling from the sky. That got my attention. To make this photograph I stopped along the edge of the storm, where the winds were very strong but had not yet picked up much sand and dust. Working handheld, since no tripod would stabilize a camera in these conditions, I stood in the lee of my vehicle for a few minutes and photographed across the blowing dust and the dunes toward the setting sun, whose light was a barely visible through the clouds. G Dan Mitchell is a California photographer and visual opportunist. His book, "California's Fall Color: A Photographer's Guide to Autumn in the Sierra" is available from Heyday Books and Amazon. Links to Articles, Sales and Licensing, my Sierra Nevada Fall Color book, Contact Information.